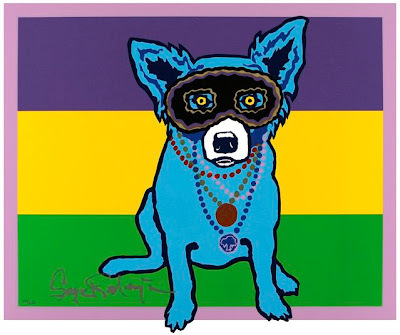 George Rodrigue created his first Blue Dog Mardi Gras silkscreen in 1992. He designed the simple, strong image by hand, drawing the outlines for each color on a separate sheet of tracing paper to make the six-color print, and emphasizing the traditional Mardi Gras colors of purple (justice), gold (power), and green (faith). The print itself is the finished work of art, unrelated to any original painting. 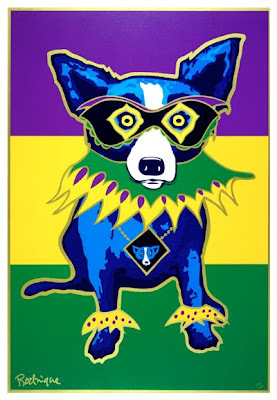 Around its neck the dog wears doubloons, one featuring the fleur de lis and the other the Louisiana oak tree as stylized years before by Rodrigue. The dog’s shape steps out of the picture frame, a neat trick since the Blue Dog never moves. Ironically, the paintings of this period show little resemblance to the silkscreens. Rather than strong blocks of color, George’s oil paintings of the early 1990s illustrate a Blue Dog (and artist) coexisting within the muted tones and rules of his Cajun landscapes. 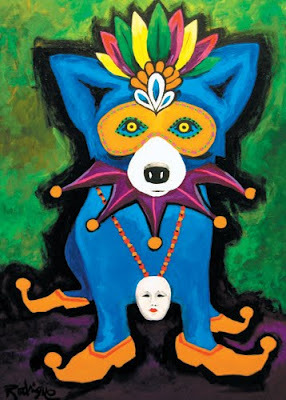 In Mardi Gras Dog (1991, oil on canvas, 30x24 inches) below, for example, he paints the dog as though it is a Cajun person, a ghost at eye level, trapped within the artist’s strong design and existing within an actual environment, as opposed to within the pure color and abstraction of the silkscreens from that same period. 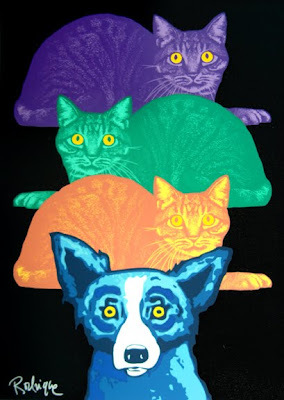 In 1993 George experimented for the first time with changing the dog’s color to something other than blue, red, or the original black-and-white. 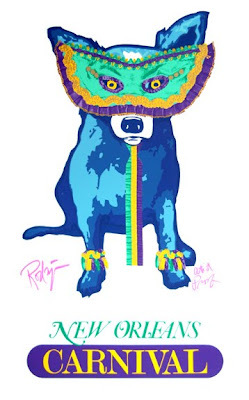 He manipulates his drawings from the first Mardi Gras print, adding an additional dog wearing a Blue Dog doubloon. 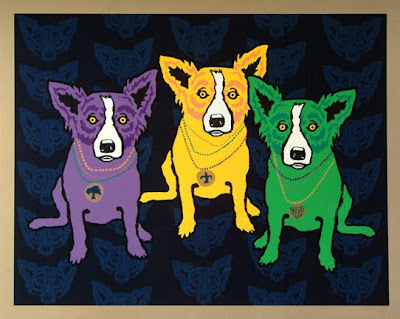 In addition, within the background of the silkscreen Mardi Gras Dogs (below), he incorporates the Blue Dog as wallpaper of sorts, barely visible behind the Mardi Gras colors. By this time, although his works on canvas remain painterly and in dramatic contrast to the prints, George no longer restricts his Blue Dog paintings to the Cajun landscape, daring to paint the dog for the first time outside of his comfort zone. 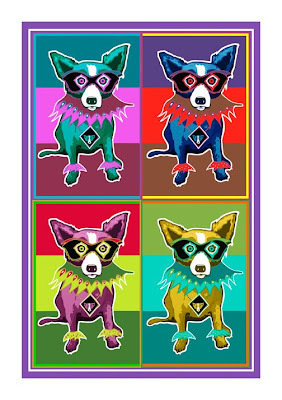 In 1995 George took on the Mardi Gras theme again, this time dressing the dog in full regalia for the silkscreen Party Animal, an edition that sold out within a matter of weeks, becoming his best-selling print up to that point. As with the painting above, the print refers to the long tradition of costuming on Mardi Gras Day. Once again without the Cajun background, George remembers his Acadian symbol, the Evangeline oak, the subject of a doubloon hanging around the dog’s neck. 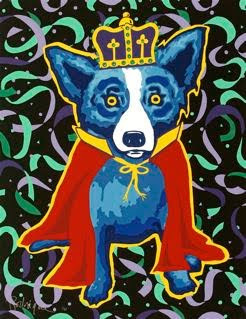 The following year he created Mardi Gras ’96 (below, silkscreen edition 50), featuring the Blue Dog as the King of Carnival. He experiments with full-bleed for the first time, so that the confetti continues without a border. His design for Carnival Time (above, 1997, silkscreen edition 120) refers to a more traditional and seasonal poster-type image. That same year he also created Mardi Gras Cats, shocking many with his design and subject. 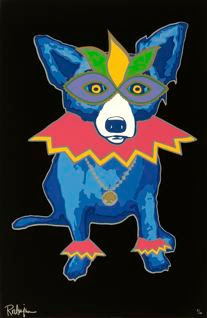 In 1999 George revisited the Party Animal design with Throw Me Somethin’ Mister (below, silkscreen edition 150), featuring a full tribute to Mardi Gras colors and a new doubloon – the first one to show the full Blue Dog face. 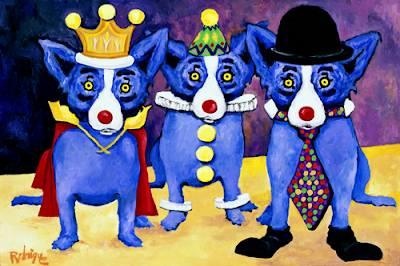 The computer also allows George to breakdown the colors and designs from within his paintings into a silkscreen, resulting in They All Ask For You (below, 2004, 24x18 inches, edition 500), one of only a handful of Blue Dog prints ever created from an original painting. In 2009 he worked with chrome for the first time, creating a series of works on the heavy shiny paper (which unfortunately does not translate well as a photograph in this blog). The images are highly reflective with an avant-garde repeated design and neon colors. Last year George again experimented with signage. The billboard-like image recalls his training at the Art Center College of Design in Los Angeles in the 1960s, along with his on-going interest in advertising design. 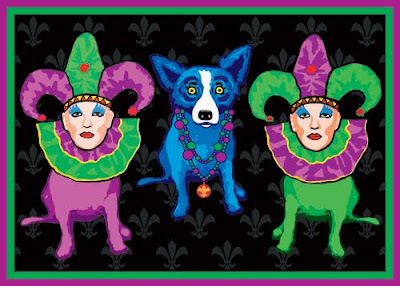 Finally, I present to you George’s newest Mardi Gras silkscreen. Mardi Gras Mambo in New Orleans (32x26 inches, edition 375) combines many of the elements featured earlier in this post with George’s excitement for the 2011 carnival season. 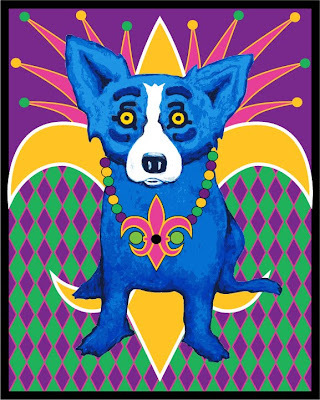 His artwork includes an overwhelming nod to the city of New Orleans with the large fleur de lis both behind the dog and around its neck. Although this essay is a basic overview of George’s Mardi Gras silkscreens, I do plan on several more posts to complete the history. 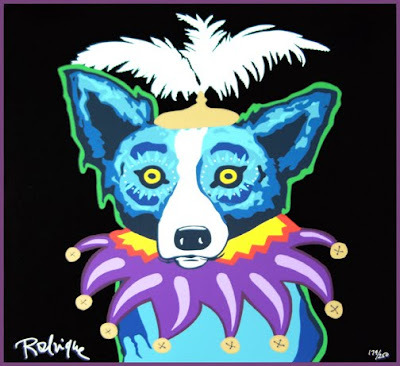 Coming soon: Rodrigue's Cajun paintings and lithographs of Mardi Gras; variations in the silkscreen editions above (such as alternate background colors and rare prints); and the story behind Mardi Gras silkscreens for the Krewe of Argus in Metairie, Louisiana and the Mystick Krewe of Louisianians in Washington, D.C. 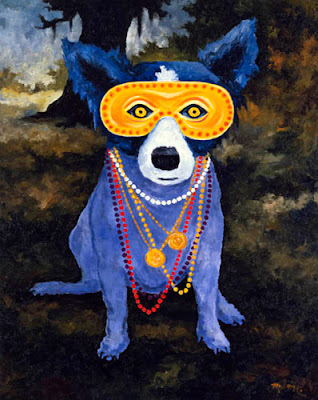 I so enjoy learning and watching Blue Dog, Mardi Gras, and George and Wendy Rodrigue. Thanks again! 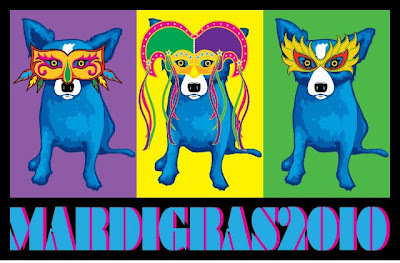 Thankfully Im able to purchase this Mardi Gras Blue Dog so he can keep my first Blue Dog company. I was feeling so bad for him being all alone. Hope my chichuahua doesn't get too jealous. So many wonderful variations it's hard to choose a favorite but I'll go with 2011 because of the NOLO elements and the blue dog front and center. Fabulous. I love my artist prof print I bought while you were in DC for the Blue Dog for President campaign. Sure wish he was running again!